No information, other than what was written on the photo, was known about this person when the picture was posted. See Jack and Marvin’s comments below. If you have other information about her, please leave a comment using the link below. Thanks! Photo was submitted by Jean Brand. Sarah Ellen “Sally” Alley was the daughter of David Jessee Alley (12/22/1831-5/10/1921) & Mary “Polly” Alley (7/5/1834- 6/19/1912). She was born in Alley Valley 11/8/1868. She married Hampton Flanery Pendleton in 1886 & had one child, Martha Victoria “Mattie”. After Hamp died, Sarah married James Elbert “Dr.Jimmy” Templeton 11/7/1891. Her younger sister Emma (Emily?) married Dr. Jimmy’s oldest son James Wallace. She is buried in the Templeton Cemetary near Manville school. Jim Wright, the outlaw was my great-great grandfather. My grandfather Luke was the son of TJ Wright, Jim’s son. I believe John Templeton was Jim’s nephew, his sister’s son. We know very few of the facts surrounding this story as grandfather Luke never talked much about it. Anyone with more information please e-mail me. I believe the Wright -templeton gang also murdered a man name roberts in the early 1900’s What do you know about that??? The information I have about Jeff Roberts is that he boasted he would kill Jim Wright and place his head on a pole and collect the reward. Wright and Templeton heard this and went to Duffield where Roberts lived. Jeff’s wife said he wasn’t home but they could wait for him. When Roberts returned his wife said some men are looking for you. Jeff apparently recognized them and alerted his wife. She tried to bring him his pistol. They killed Roberts. Templeton wanted to kill the wife too, but Wright threatened his life as he refused to kill a woman. In one of the notes it indicted Wright-Templeton was killed 1902-1903–does anyone have the details as to when,where and whom killed the two. Still doing reseach–any help would be appreciated!! About a year ago, I found a web site reference for an article on this. It’s from the Tazewell (Va.) Republican newspaper. Could anyone post the Tazewell Republican article (1902-09-11)? The link doesn’t show anything anymore. Hi Becky, I fixed the link, it works now. In 1902, Jim Wright and his nephew John Templeton attended a party at Looney’s Gap, in Scott County, VA. Jim was suddenly surrounded by lawmen. He shot the sheriff with his winchester rifle, but then it jammed. Realizing escape was impossible, he grabbed his pistol and ran into the posse shooting. Jim Wright was riddled with bullets. Dead as he lived, at age 51. John Templeton had left the party to take a girl home. Upon returning he was ambushed and killed. He was 24. Albert Templeton died in the Knoxville jail where he was taken for “safe keeping”. He was 26. Jim’s prison buddy, Crabtree disappeared after this. It was suspected he had set up the “kill” and betrayed his old friend. Members of the posse referred to him as “Brother Crabtree”. Some said one of Jim’s sons disposed of him permanently. One account has Jim buried at Dotson cemetary in Eidson. Another says Jim and John’s bodies were brought back and buried near the old Templeton homeplace in Pumpkin Valley. Jim’s widow Margaret lived into her late-70s in 1935 in Appalachia, VA. John Templeton’s widow, Sarah Sally Bray was “95 years of age” in Appalachia, VA in 1969. Dear Becki, I’m curious how you know this about jefferson Roberts. He was my great great uncle. I’m currently doing research on my family history and have came to a brick wall with his father, Elijah Roberts. Any info or tips where to look would be greatly appreciated. I did find a picture of jefferson on ancestry I believe it was. My Great Grandfather was John Templeton and Sally Templeton my Great Grandmother. She died at Park Avenue Hospital in Norton Va in 1970 at the age of 96. She lived her last years with her daughter Laura. i have a picture of John Templeton sitting on a cane back chair holding a revolver. Not sure of the date of the picture. I have a cousin in St. Louis whose name is John Templeton Brooks, his father was Curt Brooks who lived in Gas City Indiana since the 1960’s. My Grandmother’s name was Eva Templeton Brooks who was married to Cicero Brooks and moved to ridge avenue Appalachia Va about 1954. My Mom still lives in the house today. 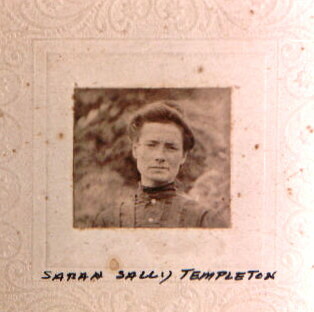 My great grandmother Nancy Bray was a sister to Sarah Sally Templeton. Nancy Bray married James Patton Lawson and their son Gale Lawson was my grandfather. I would love to learn more about whether there was a brother named william that seemed to have disappeared but my mother remembers her mother speaking of him. I am also interested in the Cherokee Indian connection in Eidson TN area where my mother still resides on a farm inherited from her father Gale Lawson and his father James Patton Lawson. Can anyone tell me about whether the Lawson’s were Cherokee Indian or not? I am a nurse practitioner and live currently in Wesley Chapel FL . My thesis in college was “Measuring Healing in Native American Indians” and as a result of that research I ended up speaking and collecting data from Vivian Lawson Chief of the Southeastern Cherokee. She connected us through a several generations back great grandfather William Nathan (Nate) Lawson who I beleived was susposed to be joined in some type of marriage (whether legal- I doubt) to Wurteh (Cherokee Indian maiden from Loudon TN ) who was the mother of Sequoyah. I have the roll number- (Guillon Miller) 138218. Can anyone ellaborate on the possibilities of this information being accurate of not. I have seen this same pictuur of Sarah Sally Templeton at my grandparents home now owned by my Aunt Catheriine Lawson of Eidson. She also has a picture of Nancy Bray (my great grandmother and Sarah Sally Templeton’s sister) on her living room wall.- I have the genealogy back to William Nathan Lawson that was given to me by Vivian Lawson who was actually married to my 5th cousin and chief of southeastern CHerokee Council through him. She lives in GA.
My great grandmother was Martha Jane Bray, daughter of Andrew Jackson Bray and Susan Anderson. Martha Jane was born in Hawkins Co., TN, from what I can find. There is a family history memoir written by a Eula Mae Lyon McNutt at http://www.tngenweb.org/hancock/lyonsdata.htm that says Susan had an affair with her older sister’s son-in-law and had a child by him. When Andrew found out, he divorced her. Eula Mae said Susan had six more children after her divorce: Gayle Lawson, Eidson, TN, was from one Dad and another married John Templeton, the outlaw with Jim Wright. John’s wife was Sarah or Sally on the 1900 and 1910 census. Susan Bray is living with John and Sarah Templeton in Hawkins Co. in 1900 and then Sallie (widowed) Templeton is living with Susan Anderson in Hancock Co., TN in 1910. Eula Mae also said Susan died in 1915 and is buried in Eidson, TN in the Lawson Cemetery. Do you, or does anyone know anything about Susan Anderson Bray and her possible connection to these people? Any help would be greatly appreciated. Cynthia, please contact me re: William Bray. He’s my grandfather. Is your Gale Lawson, a brother to Monroe Lawson? And your Mother Margaret???? My Gale Lawson is Gale Charles Lawson (1906-1983), born to Nancy Anderson/Bray and James Patton Lawson. Gale had two or three brothers, Hugh Eugene Lawson and Washington Monroe Lawson. James Patton Lawson had a brother named Martin Monroe Lawson. I don’t see any Margaret. Again, Nancy Anderson/Bray is my great aunt, sister to my grandfather, William Bray. I am related to elizabeth Lawson Born about 1753 married to George Rogers. I believe she was the daughter of William Lawson and Wurteh cherokee. Wurten was also married to John Benge and Nathaniel Gist. Do you descend from Drury Lawson married to Hannah Potts or possible a Thomas Lawson. to your Elizabeth Lawson who married George Rogers. According to family records, Drury was a half brother to Chief Bob “Robin” Benge b. 1761 d. 1794, so your Elizabeth would be their sister. lived in the area where Trader John Benge lived in former Surry Co., NC in 1750.
men and lived in white settlements on the frontier. While William Lawson did own land about 76 acres in Halifax and later Pittsylvania, Henry and last Patrick co., VA, he was more a hunter than farmer. the wolf was always the most difficult to kill or trap. I recently had my DNA and my father’s Y=DNA to prove that Thomas Lawson b.1872d.1963 is our biological Grandfather. 1. Can anyone verify that these are correct? 2. I was so hoping that the indian line would come through but there was no evidence of american indian in either my DNA or my Dad’s. This makes me tend to think that Wurteh was NOT our grandmother? I have just proven, through DNA that Thomas Lawson b.1872d.1963 is my Gr Gr GF. I would love to share with all! I am related to Thomas Lawson. Several members of my extended family has traced the Lawson’s and I was told we are from the Falling Branch Cherokee’s. I do not have all the names in front of me but I think Thomas was my great grandfather. I’d have to drag out my list that different family members have been working on for years. Last summer, my sister and I were told that we were also, somehow related to Benge. I was trying to find information as to how that connection was made. The red headed indian, Benge. Anyone with any information, I would greatly appreciate hearing from you. I am interested if this William Nathan Lawson is my multi-gr GF? who had a son Thomas? Most excited to have proof!! I also have an Ancestry tree: Rudd/McMillan. There might be errors on it so feel free to correct me!! My maiden name is Lawson. I have been told stories all my life about my Cherokee history. Would love to learn more about the truth of my heritage. My father was William Lester lawson, born near Louisville, KY, 1916. His grandfather was a Cherokee, supposedly named Mountain Peak. Does anyone have any information regarding this? Susan Anderson Bray’s son William, as mentioned by Cynthia Sue Campbell, is my grandfather. He was born 2/14 in either 1877, 1880, or 1881 in Rogersville, Hawkins Co. TN. But the date 11/14/1883 also appears on two documents. His social security application shows Andrew Bray as his father and Susan Anderson as his mother, but they were divorced after the adultery scandal in the 1860’s. Therefore, Andrew Bray cannot be his father. Who? I found his brother and sisters from Andrew Bray on Ancestry.com but couldn’t tie William to anyone in the family until now. My father, William Bray, Jr. has always said that he was part Cherokee from what his father told him. If anyone has info on William Bray, please contact me at marcieann@comcast.net immediately! I’ve waited so long to find this. My name is Marvin Byrd. I saw your post from August 7, 2013 talking about your connection to the Flannery’s. I’m related to the Templeton’s through my great grandmother Susannah Templeton. I’m looking for information on the Jim/ John and there connection to Flannery’s and Vances. Anything you may provide would be very much appreaiated. Frankie, I do not have any information on the Flannery’s but do have an emal address of someone that does know something about them. Frankie, Did you get any response from the E-mail I sent???????? Betty, please contact me about the Gale Lawson connection. Looking forward to connecting the dots! I’ve been in touch with her and Tim Childress the story I was referring to above was written by her. It’s a story about Nancy Vaughan which was the grandmother of Patton Baldwin Flannery. It’s a very nicely written story. Thank you for your help Betty. Betty, please contact me about your connection with Gale and Monroe Lawson or Margaret. Laura, I was wrong about the Lawsons. I guess there were several with the same names. My Lawson’s Father was called Drag. And nothing I have seen has him listed. Monroe Lawson was married to Ruth Green. I heard stories about how my grandfather harbored the fugitives because John Templeton was related. Grandfather was Thomas C. Templeton Sr. I also heard there was a book about all of this in the Kinsport Library which no longer exsist but my father said he had read it. I would love to read this book. Sure wish I could get a copy or at least the name of the book.